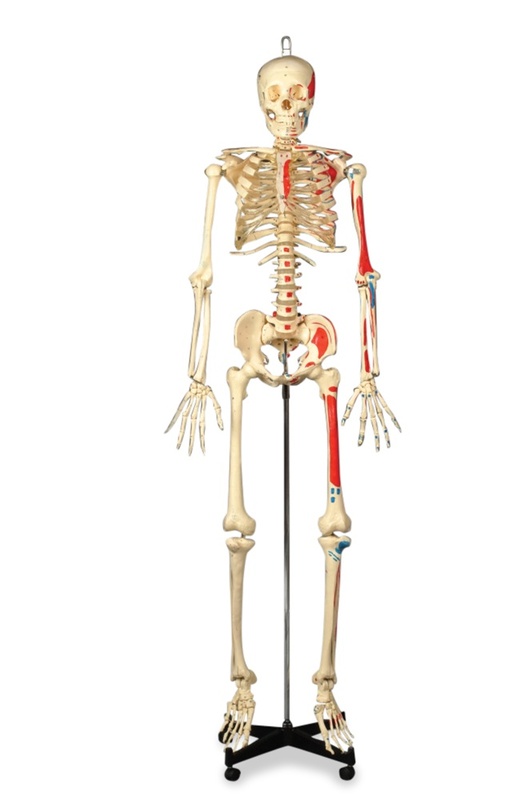 With an overall dimension of 5’6” tall, weighing 23 lbs., this Budget Painted Skeleton Model comes with a life-size numbered skeleton that includes muscle insertions and origins which is painted on the left side of the skeleton while the numbers of the significant features can be found on the right side. Aside from that, its Calvarium is cut with a moveable jaw that is mounted on springs. Its arms, legs, and skull are both moveable too! This includes a stand that is very helpful for an easy maneuver so you can move it easily anywhere you want. And because of the nature of this budget model, this is highly recommended for a basic anatomical study including high school and general undergraduate anatomy courses. For advanced study and a more detailed feature, you may also want to check out our high-end models. 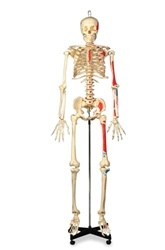 LIFE-SIZE- This skeleton model is perfect for a large group presentation because it has an overall dimension of 5’6” in height that will definitely give you a life-size view. BUDGET MODEL- Unlike other high-end models, this model is very affordable and budget friendly. This is highly recommended for a basic anatomical study including high school and general undergraduate anatomy courses. STAND INCLUDED- For an easy maneuver, this painted skeleton model includes a stand that is attached to its pelvis. FUNCTIONAL- Its Calvarium is cut with a moveable jaw that is mounted on springs. Its arms, legs, and skull are both moveable too which is very helpful for a further study. PAINTED AND NUMBERED- For easy identification and examination, this Budget Painted Skeleton Model comes with a life-size numbered skeleton that includes muscle insertions and origins which is painted on the left side of the skeleton while the numbers of the significant features can be found on the right side. I ordered this as a teaching tool for my staff. with just a quick look I noticed that there were several muscles that were marked inaccurate. I originally thought that this would be a great tool for my staff. However, with all that was inaccurate it made it impossible to use the product without confusing them.